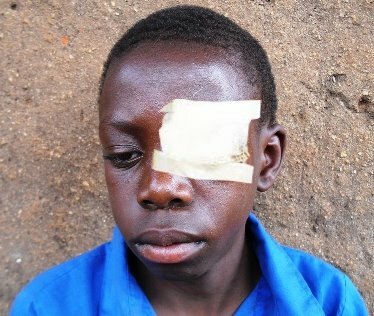 A teacher at Njedza catholic primary school in mulanje has injured a standard 5 learner after whipping him twice on the eye with a stick. A teacher was identified as Stanley Matemba aged 47 and the puplil as Precious Mapaya. Precious Mapaya who hails from Njedza village, Traditional Authority Mabuka in the district was wounded on Wednesday after his Social Studies teacher got angered by some students who were making noise in the classroom which prompted the teacher to whip the whole class randomly. According to the child, the teacher whom the community well knows to be a usual drunkard struck him twice on the eye with a chalkboard pointer. At a time the child was busy copying notes from the chalk board. “That time I was seated and copying notes from the board. There was noise in the classroom; some boys who were not writing and walking all over the room. I heard Mr. Matemba shouting above his voice telling them to sit down, but they did not. Suddenly I felt a struck on my eye and another, and then blood started flowing from my face,” explained Precious who complained of constant headaches and some stinging on the bandaged eye. He further explained that he was taken out of the classroom by the teacher and was sent home alone to inform his parents about what happened. He was later treated at Mulanje District Hospital and had three stitches on one cut below the left eye and got medication on an open wound on the left outer side of the eye. Reports reaching FaceofMalawi indicates that District Education Manager Gossam Mafuta described the scenario as sad and uncalled for while indicating that his office would ensure that such things do not happen again. “It’s unfortunate for this to happen at a time we all know that corporal punishment ended long time ago after the inception of multiparty system government. It is specifically illegal in education institutions, but again we want to promise the community that such things are not allowed and we will ensure that our member of staff (the teacher) is treated accordingly, so that further incidences could be avoided,” said the Education Manager. He however raised concerns on the conduct by family relations of the victimized child who “man-handled” the accused teacher in front of his learners when they came to take him to police. Head teacher of the Institution, Handford Katuli alleged that three men caught the accused teacher as he was relieving himself at the washroom and dragged him out with his trousers hanging around his knees, showing off his inside dressing. Meanwhile Matemba who hails from Waluma Village T/A Nkhumba in Phalombe has been released on bail, but will soon appear before court to answer charges of unlawful wounding a learner.